If you're looking to save energy at home and reduce the cost of your energy bills, it can be difficult to know where to start. Our energy saving tips will help you to identify areas in your home or aspects of your living habits where you can start to make changes easily and reduce your energy costs. We’re all responsible for the energy we use in our homes. Many people stay on the same tariff or with the same energy supplier for years, without shopping around to see if they could be getting a better deal elsewhere. By switching tariffs or suppliers, you could save hundreds of pounds on your fuel bill. Most people shop around for their car insurance, so why pay more than you have to for your energy? Shopping around for your energy supplier could save you around £200. we've made it easy for you to see how much you could save with the "Money Advice Online Energy Switch" service. You can check online how much you can save by clicking here or if you prefer to speak with someone we have a dedicated team to talk you through your options. You can call the Money Advice Online Energy Switch team free on 0800 088 2208. If you're happy with your current energy supplier, you can still make savings on your bill with some providers by switching to direct debit payments. Once you have made sure you're on the best deal for your energy, the best way to save more is to use less energy around your home. This doesn’t mean doing without - you can waste less by being energy efficient. The Energy Saving Trust estimates that the average home in the UK could save up to £130 per year - and avoid emitting 500kg of carbon dioxide - simply by taking energy saving steps. Almost all electrical and electronic appliances can be turned off at the plug without upsetting their programming. It's tough to remember to switch things off all the time, so a great investment to save money is a standby saver which allows you to turn all your appliances off standby in one go. A water efficient shower head could save a four person household (eg a family of four or even a shared student flat) around £67 a year on gas for water heating, as well as a further £100 on water bills if they have a water meter. DIY draught-proofing of windows, doors and blocking cracks in floors and skirting boards can cost around £200, but can save up to £25 to £35 a year on energy bills. More than half the money spent on fuel bills goes towards providing heating and hot water. Having a room thermostat, programmer and thermostatic radiator valves installed could save you between £80 and £165 a year. 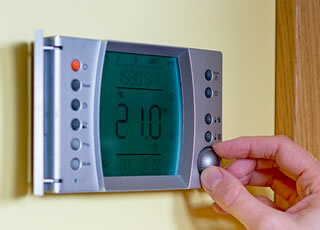 Even turning down your room thermostat by just one degree can save between £85 and £90 a year. Check what grants you may qualify for. You should also check if you qualify for the Government's free boiler grant, which enables old, in-efficient heating boilers to be replaced completely free of charge. You may also qualify for a £140 Government grant to help with electricity bills? Have you received you Government Electricity Rebate? Need help with energy costs? Our team of experts will send you their answer by email within 1 working hour. "To enable us to take advantage of the free boiler. We had a to supply answers to quite a few questions. The company was efficient and processed our request and kept us very well informed all the time and today the new boiler was fitted . So we are delighted. As pensioners we might have had a problem with heating our home this winter as the previous boiler was pretty old and inefficient causing quite a few problems over the last twelve months. Job well done. Very pleased." Does your bank owe you money? Check now..